P!nk has proven to be an intelligent, rebellious, brave and talented singer and she selflessly uses all of those qualities to fight for animal rights and protection. Like a real activist, P!nk has never missed a chance to stand up for animal rights. When she found out that prince William, the future king of England, is a hunter, she refused to sing at the celebration of his 21st birthday. That was just one example how she rather stands up for animal rights than to perform at the important events. Back in her school years she was always doing research papers and debates based on animal rights. She truly believes that every person should be aware off all the horror that animals go through and all because people use them in their evolution race such as food products, expensive hair colors, tasteful tooth pastes or nicer coats. Even though she can't say that she never wore fur, she describes herself as a selfish person back in those days. She also thinks that she became much wiser and that now she completely boycotts fur clothing. She helped the promotion of anti-fur politics in New York's Center Fly by posing for PETA's anti-fur commercials. As a PETA activist, she sent a hand written letter to the editor of Vogue, asking her to exclude all fur promotions out of the magazine. In her letter she wrote that one of the fashion characteristics is that it changes in time and that all their customers would definitely not even touch fur if they knew what horror that causes to animals. She also wrote that if those items weren't treated with all kinds of chemical products they would fall apart and rot. She didn't even spare the queen of England from her beliefs. She was truly shocked when she found out that queen's guard ceremonial hats were made of the Canadian black bear skin. P!nk wrote to the queen of England asking her to change those hats with something that's made of artificial fur as well as not to let her reputation be ruined by money hunters. P!nk made a petition against KFC (Kentucky Fried Chicken) with which she wants to face all the people with the fact that every year, only in the U.S., 850 million birds die only because of the human wish to eat meat. She also points out that all those people would loose their appetite if they saw how these birds were treated. This petition's goal is to eliminate all the worst chickens' torture that happens at the industry farms and butcheries. Another goal is to prevent all those terrible injuries that occur as a result of the brutality, drugs usage and throat cutting and all of that while they are still alive and able to feel the pain. 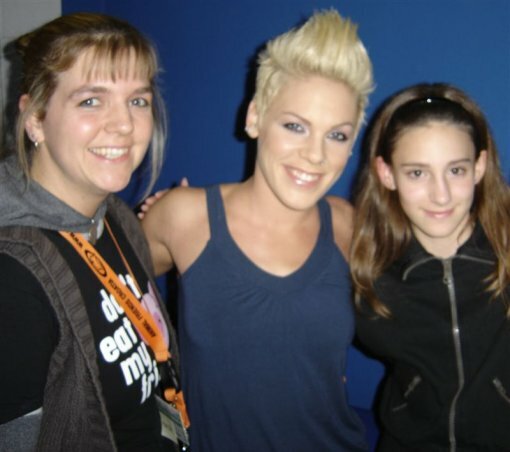 P!nk is the owner of four dogs and two rats that she saved from the death. She also wants to open a pig shelter which would exist for all those pigs that are destined to become human food. "I've always felt that animals are the purest spirits in the world. They don't fake or hide their feelings, and they are the most loyal creatures on Earth. And somehow we humans think we're smarter - what a joke. I wish every person was forced to know and learn and experience the horrors that these animals go through at the cost of our trends," says P!nk. Concert of the "rebel with a cause" will take place on December 15, 2006, in Basketball center Drazen Petrovic in Zagreb.